Life has been busy and quite full which means I have plenty to blog about but not enough time to get it done. April has been a month of celebrations for us. I thought it would be fun to share some of the highlights with you. At the beginning of the month we celebrated our 35th wedding anniversary! How can that even be possible? We were very young and in love back in 1979. I can truthfully say that we are still very much in love and we are young at heart! 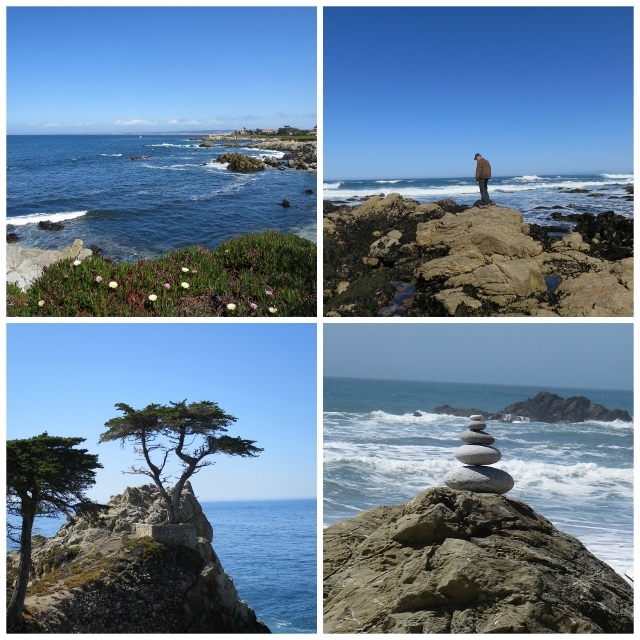 For our anniversary celebration we went over to the Monterey/Carmel area for a few days of fun. The weather was fantastic! We attended a music festival, went hiking, drove on some amazing roads, ate delicious vegan food and had an incredible time! I made up a few foody things to take with us, lentil salad with spinach, hearty garbanzo bean flour omelets, fresh fruit, veggies and vegan snack bars, roasted edamame and roasted garbanzo bean snack packs. We took a cooler and booked hotel rooms that had microwave ovens and small fridges. I did a little (okay a lot) of internet research before we went on our trip to locate the best restaurants with vegan food to set us up for success when eating out. I found Yelp to be my best resource for finding vegan options. I took the time to read reviews and browse the individual web sites to get familiar with the menus. We had two multi course meals at a Vegan restaurant called Julia’s in Pacific Grove, CA and the food was amazing! We ate there two nights in a row. One night there was a guest chef who made a fabulous pasta dish. It was so nice to be able to order anything off the menu and not have to worry about it being plant based or not. The servings were so huge we were able to box up the leftovers for our lunch on the trail the next day. The second night at Julia’s it was a set menu with a 4 course menu that was served family style. We could have sat at a long table in the center of the dining room with other guests but we opted for a small private table off to the side. It’s so much easier to find good vegan/plant based food over on the coast for some reason. We enjoyed a wide variety of foods like pasta – veggie stuffed raviolis, salads, butternut squash enchiladas, vegetable curries, fake chicken drumsticks, veggie spring rolls, stir fries, vegan chocolate cake, vegan ice cream and a vegan spice cake. Believe it or not I didn’t gain any weight eating out so much. We hiked or walked every day so we worked off all those extra calories. Since hubby Tom still likes to have some meat, fish or chicken when dining out I also searched out a nice restaurant for dining out on our anniversary night. I called the restaurant Passion Fish in Pacific Grove, CA a week ahead to make our reservations and to talk to them about my dietary needs. They were very helpful and willing to provide me with a variety of options for a whole foods plant based meal. The only thing they couldn’t make me was a dessert. I was fine with that since we were having other dinners at vegan restaurants where I could order desserts. 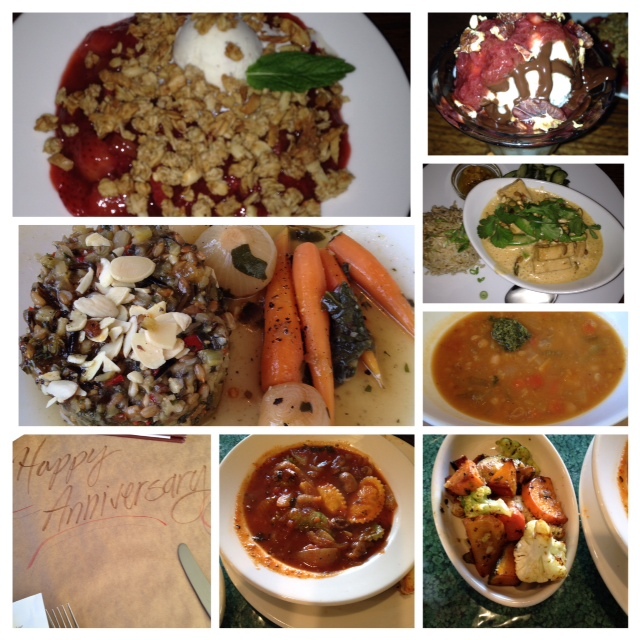 I started our anniversary dinner off with a hot bowl of vegetable soup with pesto, my entree was a warm whole grain tabbouleh with an orange spiced gastrique topped off with almonds and served with roasted carrots and onions. Elegant and flavorful. I loved it. At one of the restaurants we ate at, even though they didn’t have an all vegan menu they had a few vegan options for entrees and even had a vegan ice cream sundae complete with a chocolate sauce! 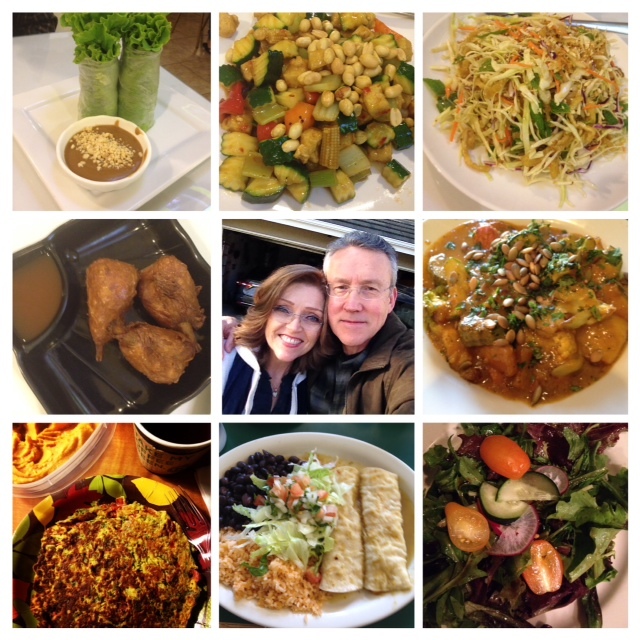 It was so easy to eat plant based/vegan food while vacationing. After a few days in the Monterey area we drove on down to Cambria CA. There were lots of beautiful spots along the way to stop and enjoy. With the recent rains the hills were lush and green. 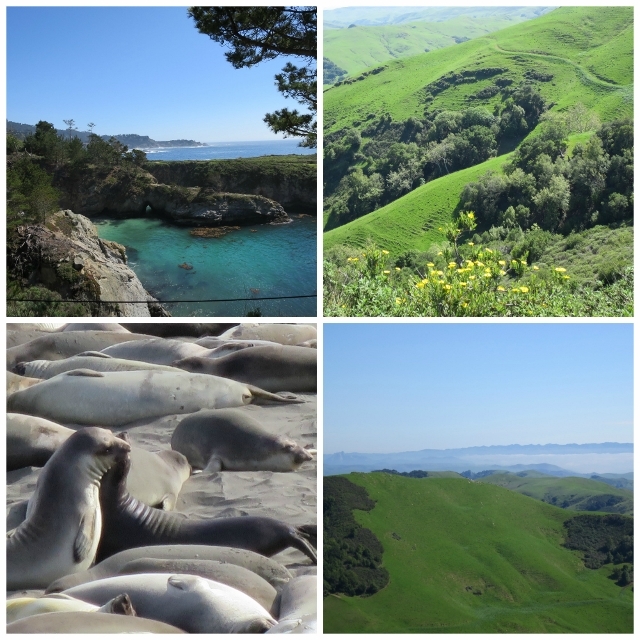 The beaches had lots of elephant seals to watch – they were quite entertaining and provided awesome photo opportunities. 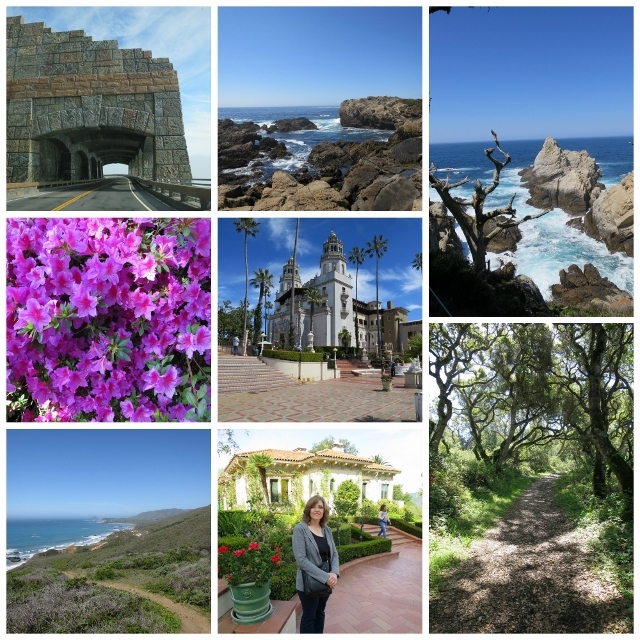 One day we went to the Hearst Castle and took two different tours of the amazing mansion. We got to see the main house, the bedrooms upstairs as well as the main floor rooms. Everything is decorated over the top! Amazing what you can do when you have an unlimited amount of money. After the guided tours you get to roam around outside and take your time to look around and enjoy the gardens and the views. It was a relaxing fun day. The entire trip was a wonderful getaway and we enjoyed every minute of it. Then it was back home and back to our real life. You know laundry, grocery shopping, chores, cooking and cleaning. Sigh. Well that was just the first celebration this month. In my next post I will let you know what else we have to celebrate! If you could go anywhere you wanted where would it be? Tami, your photos are gorgeous! What a lovely way to celebrate your anniversary! Happy Anniversary & such beautiful photos!!! How wonderful & fun!!! Love the pic of both of you!!! So glad you had a great time! congrats on 35 years! Woo Hoo! Okay, where did you get the vegan ice cream, chocolate sauce and cake? We will be in Carmel this summer. When you return, check out the lasagna (vegetarian) at Grasing’s and the steamed vegetables with tofu at Flying Fish, both in Carmel. Hi Ellen! How fun to be in Carmel this summer. We ate at Julia’s restaurant in Pacific Grove two nights. They have a lovely menu and the food was amazing. The decor is old and tired but don’t let that get in your way of eating there. Everything including the bread,soup, salad, entrees and desserts were wonderful. They had chocolate cake and a spice cake that came with vegan ice cream and sauces. There is also a yogurt shop down in the tourist section of Monterrey that has a non dairy soft serve – I can’t think of the name of it right now but it was the only yogurt shop down there. In Cambria CA further down South from where you will be we ate at Robin’s Restaurant and they have some vegan choices on their menu including a vegan ice cream sundae with chocolate sauce. Thank you for the suggestions of Grasing’s and Flying Fish – we will check them out the next time we go! Happy Anniversary, Tami! Glad you had such a nice trip! Monterey and the Central Coast are some of my favorite places. We are going to the Central Coast in a few weeks for a long weekend, and I’m really looking forward to it. Thank You Andrea. I’m happy for you that you get to go over the coast for a long weekend. I love going there too! It’s usually cooler over there than it is here in the valley and its a nice treat for us during the summer months. The next time we plan on taking our bikes and riding on the bike trails. It looks like so much fun! Enjoy!